This 8-day Northern Islands Galapagos cruise on the Nemo II explores the wildlife-rich shores of Santa Cruz, Isabela, Santiago, Rabida, and more! Enjoy opportunities to hike, snorkel, kayak, or cruise on a panga boat while exploring volcanic landscapes, unique flora and fauna, research sites, and breathtaking underwater beauty on your incomparable adventure. Embark the Nemo II in Baltra, also known as South Seymour, located at the north of Santa Cruz Island. Baltra is the home of the archipelago’s main airport and is famous because it was built during WWII by the U.S navy. Cruise to North Seymour, where you can admire frigatebirds and the nests of blue footed boobies. The trees are filled by male frigates inflating their red skin to catch the female’s attention. It’s a spectacle of nature you don’t want to miss. Upon arrival at the island, travel via a round road to a gorgeous rocky seashore where silver-blue waves crash. Here there is also a highly recommended diving site, with opportunities to see hammer fishes, garden eels, tropical fishes, sea lions, the Pacific green marine turtle, and many more astonishing and unique species. Or, you can opt to go snorkeling or walk along the beach. Santa Cruz is the second biggest island in the Galapagos and is located at the center of the island group. "Los Gemelos” (The Twins) is a pair of craters formed by cavings, one on each side of the road. See a wide variety of birds, like owls, cliff swallows and finches. There’s also the Scalesia forest, famous for the great variety of plants found there that are unique to the Galapagos. Primicias is a private ranch and is the natural habitat in which world famous giant tortoises live. They prefer the higher parts of the islands, where the weather is cooler and humid. Close to this place, there are lava tunnels that once were rivers in which hot lava used to run. Puerto Ayora is a city of approximately 20,000 people where the offices of the Galapagos National Park Administration are located. The Charles Darwin Station is located here, famous for the captive breeding of giant Galapagos tortoises which can live up to 150 years. 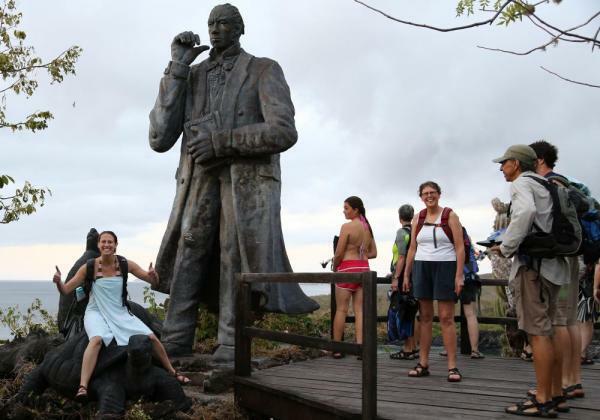 The station was created in 1964, and features a Natural History Interpretation Center that manages educational programs at the service of the Galapagos National Park. This station is also an operation center for foreign scientists to conduct research. Moreno Point is a bay located in front of the narrowest part of Isabela Island, the Perry isthmus, where there’s a water entry that has basically formed a bay within a bay with calmed waters. This makes a perfect habitat for sea turtles; giant opuntia cactus, Palo Santo trees, carob trees, and lichens. Take a small speedboat trip to observe the wildlife unique to this place. This site offers wonderful views of the Alcedo volcanoes, Sierra Negra, and Cerro Azul, which also presents photography opportunities of diverse birds. Urbina Bay is located on the west side of Isabela Island in Alcedo Volcano. One night in 1954, the whole bay was lifted 5 meters due to tectonic forces, stranding coral reefs, sea urchins, lobsters and others. The landing spot is in a little wet beach of black sand, which can be difficult when there are strong waves. There’s a land tour that begins on the bay’s beach where you will explore. Encounter numerous Darwin’s finches, but the main attractions are probably the reptiles (land iguanas & turtles). A wide variety of vegetation, such as the Palo Santo trees, chamomile, mumuyos, and the beautiful Darwin’s cotton flowers can be seen here as well. Tagus Cove is located to the west of Darwin volcano on Isabela Island, and was once the favorite place for pirates and whalers. 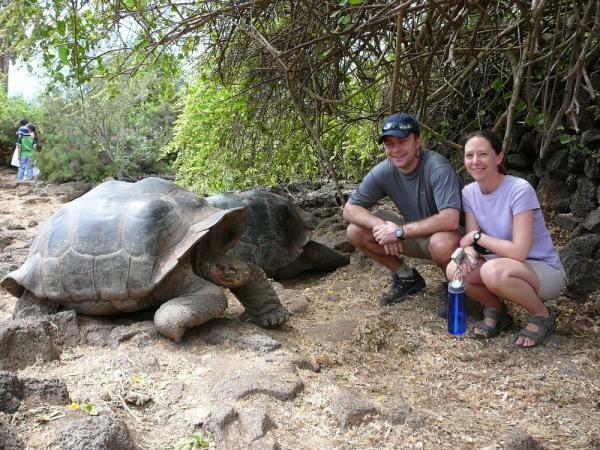 Its name comes from an English war ship that went to the island looking for Galapagos turtles to eat in 1814. At the beginning of the walk up to Darwin Lake, after the stairway, there’s a little cove where you can find inscriptions from the 1800s. Full of salt water but devoid of fish, Darwin Lake is located inside a cone and surrounded by different sized volcanic rocks. Your next stop is at Espinoza Point on Fernandina Island, the youngest of the archipelago and the most volcanically active. Espinoza Point is a narrow stream of lava and sand that extends from the base of the volcano to the sea. This is the Galapagos’ third biggest island, named after King Ferdinand the Catholic who funded the travels of Columbus. This site is famous for its huge marine iguana colonies who reunite in large numbers. It is also very popular due to the fact that it does not have any introduced mammals and is the home of rare and unique species such as the flightless cormorant, the Galapagos penguin, the Galapagos sparrow hawk, and the Galapagos snake, among others. Egas Port, also known as James South Bay, is located at the northwestern side of Santiago Island. It is a fascinating place to visit due to its history of volcanic activity, making it one of the most famous on the Galapagos archipelago. It was once used for salt exploitation, which was taken in huge amounts. At the south of the beach, there’s the Pan de Azúcar Volcano, which has volcano tuff deposits, the same that have contributed to the formation of the black sand beach. The crater has a salt water lagoon which dries in summer and turns into a salt mine. Walk along the coast above a stream of ash lava covered by coast vegetation, where sparrow hawks, land doves, lava lizards, finches, mockingbirds, and a huge amount of crabs can benfound. Also in Santiago, visit Buccaneers Cove, an especially interesting site for those who love geology and volcanoes. Buccaneers Cove got its name because it used to be a safe haven for pirates, whalers, and sailors during the XVIII and XIX centuries. The sailors used to take their boats there to clean and get supplies. View the impressive cliffs made of tuff formations and a dark reddish-purple sand beach, snorkel in deep waters, kayak, or take a panga ride. Sullivan Bay is a site of great geological interest, as it is covered by solidified and wave-shaped lava flows from 1897. The amazing lava formations attract the attention of thousands of students and scientists. Sullivan Bay is located at the Southeast side of Santiago Island. The landing can be made both on the rocky shore (dry landing)on the white sand beach (wet landing). Enjoy the walking path at this site which takes approximately an hour and a half to complete. At the beginning of the walk, find the molds of some trees and see interesting vegetation in the volcano surroundings. At the end of the walk, take a nice swim or snorkel in the clear blue water and white sandy beach located at the edge of the lava stream. Prince Phillip's Steps are located in the south of Genovesa Island. They were formed by the remaining edges of a big crater that is almost completely submerged nowadays. You can access the site through a gap located at the feet of the volcano. A bird paradise, the island attracts a huge amount of nesting birds from the ocean, including frigatebirds, blue footed boobies, seagulls, wooden petrels, and Galapagos petrels. This is the youngest area from a geological point of view. The cliffs, located in the south, are formed by a fragile lava. The walking path is above a volcanic rock road and takes approximately 2 hours. Next head to Darwin Bay, which was formed by a crater and is almost a perfect circle. At the end of the walking path, there’s a white sand beach full of sea lions and amazing birds of different species. 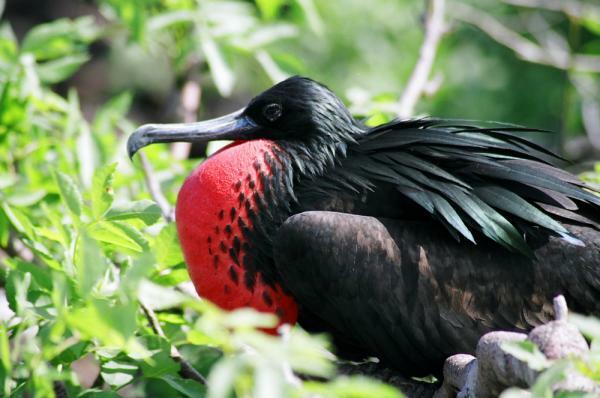 During the walk, see the nesting colonies of the common frigate, the Nazca booby, and the swallow-tailed seagull. In Darwin Bay you can go diving through the inner or outer wall. It’s a great opportunity to see up close some of earth’s most beautiful animals and some that are unique to the Galapagos. The Daphne Islands (Major and Minor) are two little volcanic islands. Daphne Major is made of a tuff crater, and does not have any trees on its surface. It is elevated 120 meters above sea level. 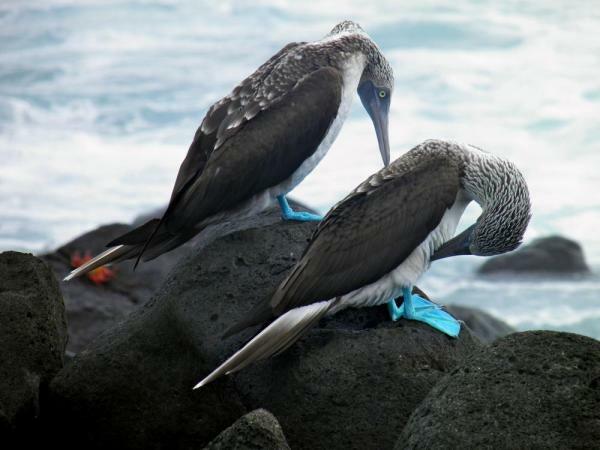 It is one of the most famous Galapagos Islands due to the fact that scientists from Princeton University (The Grants) have been going to the island for 30 years now to study the birds, especially the boobies. 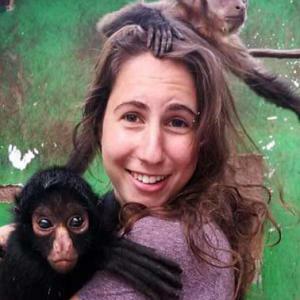 As a result, they have been able to observe evolutionary processes. This gained them and the location worldwide recognition. Palo santo trees, blue footed bobbies, masked boobies, and Darwin finches are also main attractions here. Return to Baltra and disembark the Nemo II and continue your independent travels. On board this 12 passenger catamaran, enjoy comfortable double cabins with private bathroom and hot water, spacious lounge, sun deck and dining room areas. Matrimonial/double bed and private bathroom. Lower single bed, double upper bed, and private bathroom. Two single upper beds and private bathroom. Lower single bed, lower upper bed, and private bathroom. 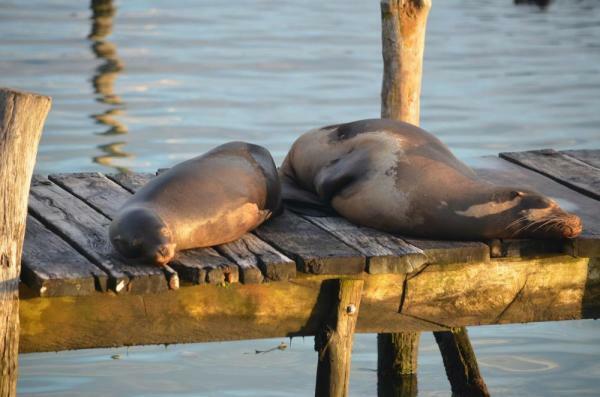 20% discount for children under age 12 at time of Galapagos cruise.